During Bernie’s quixotic mid-70s bid to become governor, I accompanied him to a meeting of local granite cutters, teamsters, and electrical workers. This was not a “flatlander” crowd, nor one dominated by full-time union officials. His audience was native-Vermonters, some of them Republican, who were still punching a clock at local quarries, trucking companies, and machine tool factories in an era when the future home state of Ben & Jerry’s and Vermont Teddy Bear Co. still had impressive blue collar union density. These local union delegates had come together to make candidate endorsements under the banner of the Vermont Labor Forum, a coalition of non-AFL-CIO unions. So Bernie delivered what is now known– due to its unchanging nature over the last four decades—as “The Speech.” (For one of its longer iterations, in hard copy form, see his 2011 book by the same name.) 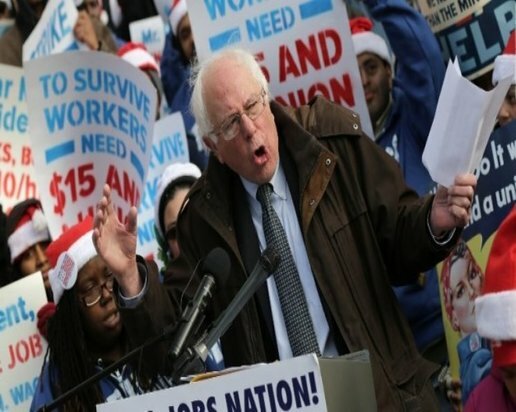 Sanders’ message to the Labor Forum was that corporations were too powerful, workers were getting screwed, and both major parties were beholden to “the bosses” (or, as Bernie might call them today, “the billionaire class,” a social category not yet invented forty years ago). Sanders’ appeal for working class support in 1976 seemed most persuasive to rank-and-file representatives of the United Electrical Workers (UE). They were, of course, members of a left-led national organization, which had long favored “independent political action.” However, in deference to their more cautious colleagues, the UE members politely went along with the Labor Forum majority, which, per usual, voted to endorse Vermont Democrats that year, despite Liberty Union’s far greater degree of union friendliness. This labor tendency to gravitate, in conservative fashion, toward the least problematic of the two major parties is still with us today, of course. Every election cycle—in every part of the country—AFL-CIO unions and unaffiliated labor organizations make pragmatic calculations about who to endorse and spend money on. Rarely do they take a chance on third party candidates, no matter how ardent their support for labor causes. Even a union rank-and-filer who runs against a corporate Democrat (for example, Howie Hawkins, the blue-collar Green who challenged Andrew Cuomo for governor of New York last year) finds it hard to collect labor endorsements. A few union leaders have issued recent threats to withhold future support from Democrats who back President Obama’s Trans-Pacific Partnership deal but Hillary Clinton certainly won’t be punished in that fashion. By the 2016 general election—and much sooner, in the case of some national unions—organized labor will be in full “lesser evil” mode once again. The only place in the nation next year where union members will have viable, pro-labor third party candidates to support, at least at the state and local level, is Vermont. And, for that, the U.S. labor movement has Bernie Sanders and other Vermont Progressives to thank. When Sanders comes knocking on their door, looking for support in his presidential primary challenge, trade unionists in other states should remember his long history of helping Vermont workers get their act together, in politics, organizing, and contract strikes. It’s a track record that few “friends of labor” can match. Bernie got his own electoral act together by “going local” in 1981. Instead of persisting as a fringe candidate in futile statewide races, he joined a four-way contest for mayor of Burlington, Vermont’s largest city. His successful campaign was backed by the Burlington Police Officers Association, which provided a key endorsement and funding after a contract dispute with the incumbent mayor, a five-term Democrat. Sanders won by ten votes. As mayor, Bernie immediately hired a new human resources director for Burlington. This union-friendly lawyer worked to improve relations between city hall and local cops, firefighters, and other municipal workers represented by the American Federation of State, County, and Municipal Employees (AFSCME) and the International Brotherhood of Electrical Workers (IBEW). During his four terms in Burlington, Sanders continued to champion the cause of workers, tenants, the poor, and unemployed, while revitalizing the city. “I was fighting for working families,” he recalled in a 2014 interview. “We were paying attention to low and moderate income neighborhoods rather than just downtown or the big-money interests. In fact, I went to war with virtually every part of the ruling class in Burlington during my years as mayor. “ The result, according to Sanders, was that “large numbers of people who previously had not participated in the political process got involved.” Sanders supporters won up to six seats on the city council and campaigned as the Progressive Coalition, forerunner of the statewide Progressive Party founded in 1999. On Capitol Hill, Sanders blazed a trail not followed since Vito Marcantonio served six terms in Congress as the lonely tribune of the NYC-based American Labor Party in the 1940s. Fifty years later, Sanders helped create a left pole for mainstream labor’s soon-to-be-thwarted campaign to reform the National Labor Relations Act during the Clinton Administration. He introduced a “’Workplace Democracy Act’ to comprehensively reform and strengthen workers’ rights…to improve living standards for American workers, which have fallen precipitously.” Sanders also promoted the idea of “economic conversion”—converting Pentagon-dependent manufacturing firms into producers of socially useful goods–a cause since downplayed or abandoned by major industrial unions themselves. Back in Vermont, Bernie used his Congressional office to help workers get better organized, in their workplaces and communities, even when the labor movement lagged behind in both areas. Sanders not only urged Vermonters to “Vote Yes” in union representation elections, he actually convened annual meetings of local labor activists to help them develop more successful organizing and bargaining strategies, in the private and public sector. To stimulate new rank-and-file thinking, Sanders and his staff invited out-of-state labor speakers who were part of national efforts to revitalize organized labor. He has been a staunch and longtime ally of the Vermont Workers Center, the statewide community-labor coalition that fights for single payer healthcare, immigrants’ rights, paid sick leave, and other working class causes in the Green Mountain State. When Verizon workers that I represented in Vermont opposed the company’s sale of its northern New England landline operations in 2006, Bernie was campaigning for the U.S. Senate seat that he now holds. He held a public forum highlighting the reasons for our “Stop The Sale” campaign and brokered a meeting with the proposed buyer, FairPoint Communications, that enabled us to confront its top managers about their company’s record of anti-unionism elsewhere. More recently, as labor opponents of the sale predicted, Verizon’s successor has floundered financially and tried to impose contract concessions on its workforce of several thousand. During their four-month strike last year, FairPoint union members had no stronger political ally, in public and behind the scenes, than Bernie Sanders. It’s an axiom of labor solidarity that help received, in a period of need, will be reciprocated, down the road, in similar fashion. Vermont union members learned long ago that the mutual benefit derived from their work with and for Bernie Sanders goes far beyond the results of labor’s usual (and sometimes tawdry) transactional relationships with public office holders. That’s why trade unionists in Vermont have turned out for Sanders as much as he’s been there for them over the years. Let’s hope that their union brothers and sisters, in other Democratic primary states, will be able to figure out which side they should be on, without the benefit of such long personal association. But, if the rest of organized labor just plays it cautious and safe, jumping on the Clinton bandwagon instead of rallying around Bernie, it will be one more sign of diminished union capacity for mounting any kind of worker self-defense, on the job or in politics.